We're loving 1 and 2 Kings this week! So many people have been loving our first Infographic on 1 and 2 Kings that we've decided that our Friday deals should be focused on our Kings resources. We're doing 25% off the brilliant commentaries by Dale Ralph Davis on 1 Kings and 2 Kings and an amazing 40% off on the new 1 Kings Good Book Guide by James Hughes. No code needed for the commentaries but use code kings40 at the checkout for the Good Book Guide to get the savings. For our US customers, use the same code, kings40, at the checkout for the Good Book Guide. All you have to do is put in the code toobusy at the checkout. This week on the blog we've been looking at the subject of Self-harm. Judging by the number of comments, shares and retweets, it has been very helpful and widely read. All of them have 25% off when you use the code suff25 at the checkout. 50% off a fantastic evangelistic book! Simply use the code ng50 at checkout to get the 50% off! This DVD based Bible study series is brilliant for 'non-booky' people and those who want straight forward English. Presented by Pete Woodcock and Lizzy Smallwood the 4 part series is based in the gospels of Mark and Luke. It introduces people to the person of Jesus Christ and the impact he made on the lives of those to whom he came into contact. 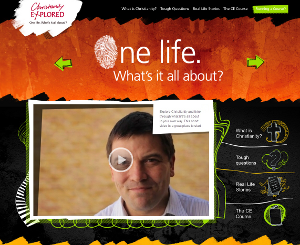 The interactive structure allows time for feedback on discussing Jesus' claims and discovering who he really is. Visit the product page for more information and to see the trailer. Time to sort out your time?! It might be that the Easter break couldn't come soon enough! The work/life/family/friends/church/rest balance has got out of hand. The Busy Christians Guide to Busyness is a brilliant book to help you get a godly attitude to time and commitments. It's a highly recommended read!! For the next 72 hours you can get it for 25% off with the code 'chestertime' at checkout. Offer expires 16/04/12. 50% off Discipleship Explored DVD's! The DVD makes Discipleship Explored so easy to run that often lots of different groups want to run the course at the same time. Brilliant! We've heard many churches running it with Mums & Tots groups, in peoples homes with friends and neighbours, as a whole church and in small groups to name a few. However what if the only copy of the church DVD gets lost? Nightmare situation! So for the next 7 days we're offering an amazing 50% off the price of the DVD so you can get a few copies and not have that panic of wondering where the DVD is. You can now run multiple courses and not worry about the talks. Simply use the code de50 at checkout on both the UK and US websites and it will automatically be discounted. Great offer on Bible study resources! We always like to do a good deal for blog readers at the end of a week! To keep in line with the home group Bible study theme we're doing 25% off all of the Matthias Media Interactive Bible study range for our UK customers. These Bible studies get to the heart of the passage with practical applications. Perfect for any group wanting to get into the Bible. For our customers in the US we're doing 25% off our Good Book Guide range. To enjoy the discount use code homegroup25 at checkout. Offer expires on 30/03/12. We hope you've enjoyed the different blog pieces we've done this week on how to best use the Christianity Explored website. We hope it's encouraged you to think about how you can use it, and other resources like it, to spread the gospel. To make the most of this offer simply use the code ce20 at the checkout. The code works on both the UK and US websites. Offer expires on 23/03/2012. 4 gift ideas Mums will love! There's only 9 days until Mothers Day and we've got some great ideas for presents. We're very excited about Different By Design by Carrie Sandom which has just been released this week! We're offering 25% off this new title. We're also doing 25% off on both What Women Really Need and Disciplines of a Godly Woman, as well as the stylish and compact pink zip up Bible! Simply use the code mothersday at the checkout. This offer runs until Thursday the 15th of March so don't miss out!